What a start to the month of September. As expected Nifty has started to move towards 7400. We are looking for a firm support at the level of 7460. The question remains, is this good enough to hold for the multi month Bull Run on the larger time frame? With yesterday’s price action, the good news for the bears is the intermediate trend has turned negative. This will add more pressure for the last standing bulls (short term investors). Meanwhile, the psychology parameter which was bullish till Monday have also turned and it indicates a neutral view. If bears manage to close Nifty lower today, we could see fear creeping into the markets. Technically Speaking, the inherent strength (marked by RSI) on all different time scales (daily, weekly and monthly) has more room to push prices on the downside. Looking at the RSI indicator on the monthly chart, I think the correction would end probably when RSI hits in between 45-50. I have seen this many a times that the correction on larger time scale ends exactly between these levels on RSI indicator. With expanding channels on the downside, which indicates more downside on the cards. In short, hold on to the cash and as soon as our correction is over, we will have opportunities to enter into solid stocks which would fetch better returns than Nifty. Intermediate term Trend: The trend which was neutral till day before yesterday has turned down (negative) with yesterday’s fall. 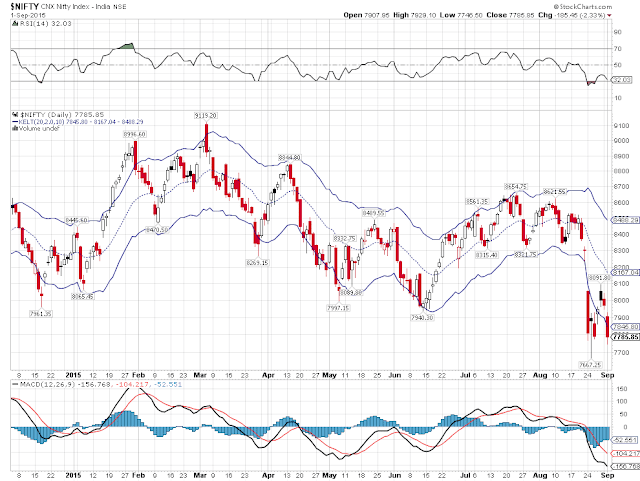 However, intermediate trend on Nifty will not hold for the day as it needs one more day of negative close.